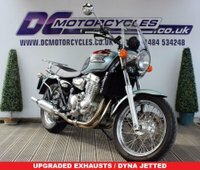 Suzuki EN125, only 14,995 miles from new! Insurance Group 4, finished in metallic black, with contrasting silver detailing. Learner Friendly - Suzuki's Single Cylinder, Four Stroke, 125cc, 12.00 HP (8.8 kW)) @ 9500 RPM, Air cooled, 5 Speed, Chain Driven, 101kg Dry Weight, 74cm Seat Height, Electric Start. - A lovely runner and an ideal first bike for any rider young or old! The bike is very economical to run with great MPG, low insurance & only £19.00 per year Road Tax! It has electric start as standard & the looks of the EN really stand out in this colour! The bike has a big clear Rev Counter & a Gear Indicator so you'll never get caught out whilst your getting used to being a biker! You could also have a top box fitted from DC Motorcycles for an additional cost, for those everyday essentials so you're all good to go! Look like a pro & go! Established in 1980, DC Motorcycles is one of the longest established motorcycle showrooms in the Huddersfield area. In stock are many New & Used bikes, & we offer finance with MotoNovo Close Brothers & Black Horse, so finance can be arranged & settled on your behalf. We also have full workshop facilities available. There is a full stock of clothing, protective equipment & many accessories on our top floor so why not pop in for a coffee and browse our stock in our purpose built showroom.